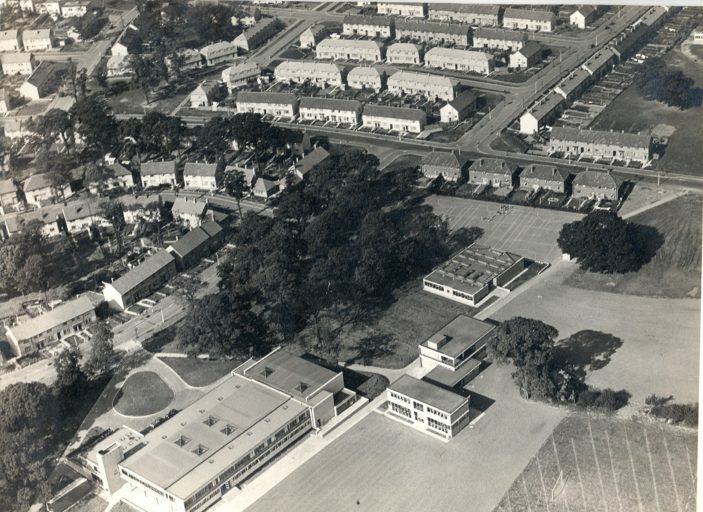 This aerial view of Clarendon School was taken in 1953. Yet another part of my history demolished! I moved into 62 Northwick Road shortly before these photographs were taken. Look at the top right corner of the first photo, where there are six terraced houses. Also just visible is part of Oxhey Wood School that I attended. I understand that OW opened on 7th June 1951, so I moved in at that time. I passed my 11+ school exams and went to Watford Technical High School. The first two years were spent in Queens Road, Watford, while the new school was being built at the top end of Bushey Hall Road. I was surprised to see that it had been demolished when I drove past many years ago. Recently I discovered that the Methodist Church in Prestwick Road had been demolished and replaced with a new church. I spent many happy hours there. A few visits ago to this website, I discovered that the library house in Oxhey Lane had gone. Not surprising as it was rather old in the early 1950’s. I can still remember getting books from the junior section. Today, I visited this website only to discover that the station approach built when I saw the new railway station was built, is now being demolished. Superb photos, Susan! Coronation Year seems to have been a popular time for aerial surveys of the still-relatively new South Oxhey Estate. These views show the main blocks at Clarendon School, Chilwell Gardens, which had been completed by September 1952, looking in a north-westerly direction towards Northwick Road. 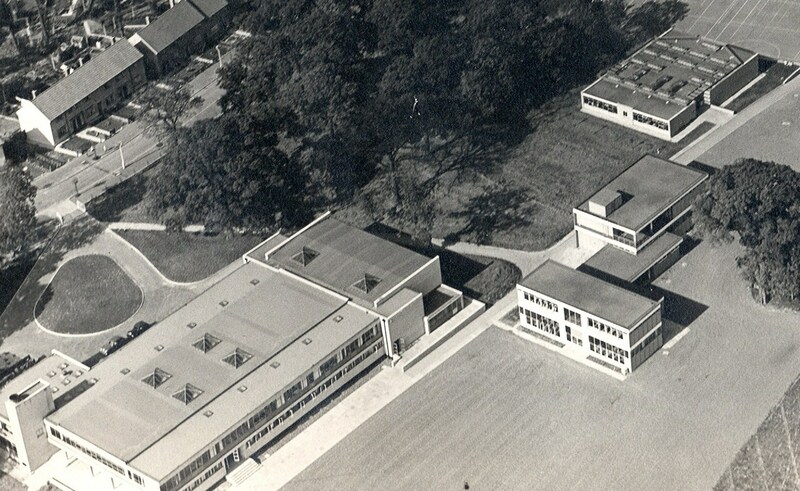 The large block in the lower left of picture is Clarendon Block, which housed the main hall, dining room, gymnasium, changing rooms, library and music room, in addition to three form rooms. Throughout the School’s short history, this building also contained the administrative offices. The next building to the right is Morison Block, containing the pottery, art & craft and five form rooms, and the final block in shot is Altham, in which metal- and woodwork were taught. Out of picture, behind the camera to the south, were the remaining teaching blocks, Carpender and Capel. As the School grew throughout the 1950s, further buildings were added at the southern (Ascham) and northern (Anson) extremities of the campus. Also apparent in the pictures is the western edge of the extensive playing field, part of which shows clearly the underground drainage channels cut in the heavy, unyielding London Clay. The writer first played football on this pitch in the winter of 1954, only a few months after the photograph was taken, for Little Furze JMI against the Under-12s at Clarendon. I seem to recall that we won 2-1!! After the site, formerly part of Sir James Altham School 1967-77, was closed, Morison and Altham blocks were soon demolished for a new housing development, but Clarendon Block remained in use for 25 years as a community centre until it, too, was removed in 2002.